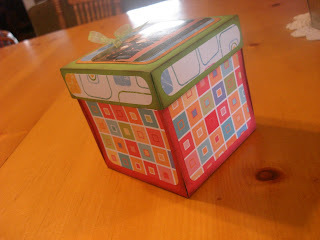 Here are some pictures of the exploding scrapbook box that I made my mom for Mother's Day this year. It was my first try and I had a lot of fun making it and will be making lots more. 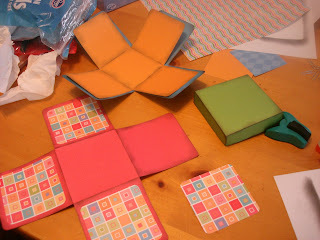 However in the future I will only use permanent double-stick tape instead of glue or glue sticks. 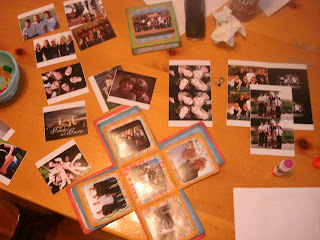 I found when the glue dried, the pages, if flexed, popped the paper and photos off if you weren't careful. I am not putting up directions but I will provide a link from the place whose directions I liked best here. These are all over the web and lots of people have different ideas about how to make them. 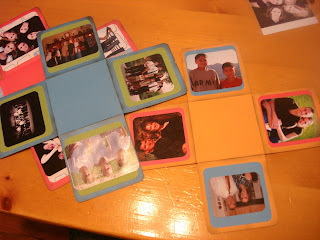 I personally wanted to maximize my use of the 12 x 12 paper size. I also sent my photos via the web to Wal-mart's one hour developer and had wallets printed so they would fit on the inside box flaps that were only about 3 inches wide. Had I planned further in advance I wouldn't have had to use the one-hour but it was okay and relatively inexpensive. 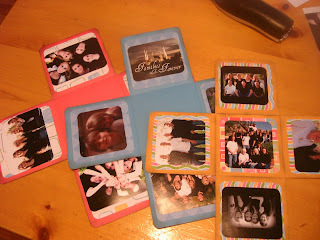 Also, with the wallets you get two pictures per sheet so I can make another one for me! I forgot to take a photo of the box, glued together, with the lid removed so you could see why it was called an exploding box. -Next time... Oh, and my Mom LOVED it!!!! It made her cry (which was NOT my intention BTW.) She is still raving about it!